Collins Booksellers - Cats in Question by John Seidensticker & Susan Lumpkin, 9781588345462. Buy this book online. What are cats? How do cats hunt? Do wild cats like catnip? Do cats dream? 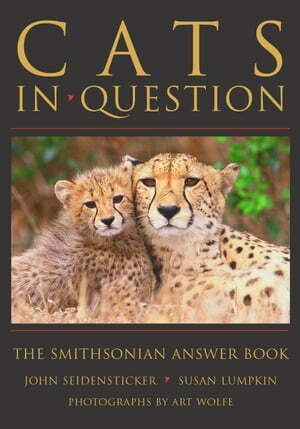 Cats in Question, a new book in Smithsonian's highly successful “In Question” series, offers authoritative and engaging answers to the thousands of questions about cats that Smithsonian scientists receive annually. All of the world’s cats are here, from fearsome predators such as lions and tigers, to mysterious hunters such as leopards and jaguars, to cuddly pets such as domestic cats. More than 100 breathtaking photographs by acclaimed photographer Art Wolfe illustrate the questions on cat facts, cat evolution and diversity, and cats and humans.